At 3:20 p.m. on Tuesday, the day before Halloween, a campus-wide email was sent out to all students, staff, faculty, and the monastery of Saint Anselm College. The group already has a reputation with law enforcement officials, as they have been reprimanded for preaching in malls and other local area stores. 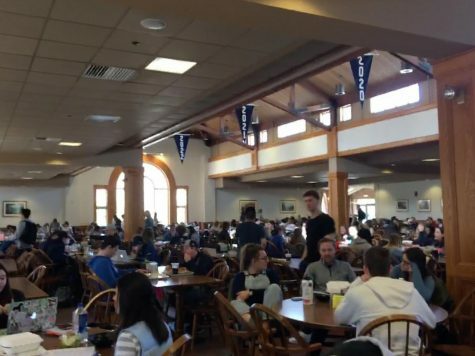 It is likely that their interactions with law enforcement will increase since campus police reported them to the Goffstown Police Department. The email stated that they did not pose an apparent threat but made students very uncomfortable with the excess of personal information they were asking for, such as emails and phone numbers. Although this was not mentioned in the email, many students are worried that the group is part of a ring of human traffickers. This probably springs from their use of aggressive recruiting tactics, as well as the fact that they mostly target women to join. At this time, there is not enough evidence to fully promote this idea, so it is hard to distinguish it from a rumor. It is much more probable that they are just very enthusiastic missionaries. If you even try to Google “World Mission Society Church of God,” the result “World Mission Society Church of God Cult” comes up pretty quickly, so that’s quite suspicious. The website itself is quite overwhelming, heavily concentrated with religious language, and with a large focus on volunteer work that they’ve done and service awards that they have received. Selfless volunteer work is commendable, but this Church appears to use it as a selling point more than anything else. The new religious movement began in South Korea in 1964. They believe that the founder Ahn Sahng-hong is the Second Coming of Christ and that a woman named Jang Gil-ja is God the Mother incarnate. The religion is controversial because the Christian Council of Korea has described it as “heretical,” and its beliefs aren’t widely accepted. The church is also against expressing religion through crosses, statues, or stained glass. Cult researchers have targeted the organization and accused it of having cult-like qualities. There are also former members who stated that the group exerted excessive control over them and attempted to separate them from family and friends. Those are major warning signs of cults, especially when the members feel exploited, and think that the group isn’t being fully transparent with all of its actions. It’s been active in America for quite a while and has also raised concerns here. In 2015, People magazine conducted an interview with a former member, Michele Colon, who attended WMSCOG services in New Jersey for two years. She had also ended up suing the church. Colon described it as a “doomsday cult” who tries to recruit those who are going through a rough time and feel a lot of emptiness in their lives. WMSCOG actively tried to control their members with guilt and fear. Colon’s personal experiences as a member were being “micromanaged” as the cult tried to control which music she could listen to and forbade her from using the internet. She was also very put off by the fact that the figure they revere as God is a living Korean woman in her seventies. In 2013, she filed a civil suit against the church, calling it a “profit-making cult” that uses many psychological tactics to control the behavior of members. District and appellate state courts rejected her suit, saying that the group was protected by the religious freedom aspects of the First Amendment. The appellate court ruled that it was constitutionally unacceptable to thoroughly examine the structure and operations of the church. Rick Alan Ross, a cult researcher, has investigated the church due to claims that it has lead members into bankruptcy from excessive donations. The church members are also pressured to live in group housing, which isolates them from contact outside of the group. Cathleen Mann, another expert on cults, has described the doctrine of the church as “fear-based” and obsessed with the preaching of the God our Mother figure. The U.S. Cult Education based in New Jersey keeps tabs on the church. So, it is not officially labeled as a cult yet, but there’s a strong chance that it could be one. The church’s recruitment has been a widespread problem on college campuses across America. These include colleges in New Jersey (where a lot of the group’s action is based in America), Mississippi, Kentucky, Georgia, Massachusetts, and now New Hampshire. Even if the WMSCOG recruiters are not human traffickers or cultic, they are still unauthorized visitors on campus. We like to think of Saint Anselm College as a safe place that is more cut off from dangers that face larger schools in more populated areas. It is disheartening that the controversial recruiters made their way on campus, as they caused a lot of discomfort and fear. Campus security responded very quickly to the threats and removed the recruiters to ensure student safety. It is a good idea to avoid controversial groups and people who come up to you and begin reciting bible verses right off the bat, as well as those who ask for a suspicious amount of personal information.